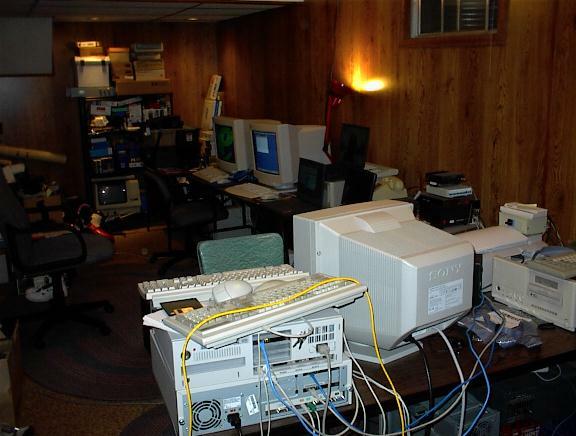 Here are some pictures of the home computer network. I have gone a little overboard. But it is all quite a bit of fun. In the foreground you can see the backside of two of the P133 machines. The bottom one is the router and firewall. The top one is the web server and other general purpose server. Here is a shot from a little higher up. I think the color is better in this one. And now you can see the VT-102 sitting on the shelf in the background. The entire room at a glance. The left most is a Pentium-III 500MHz on loan from a friend, Frank, for some networking. Second from the left is my AMD Athlon 650MHz machine. 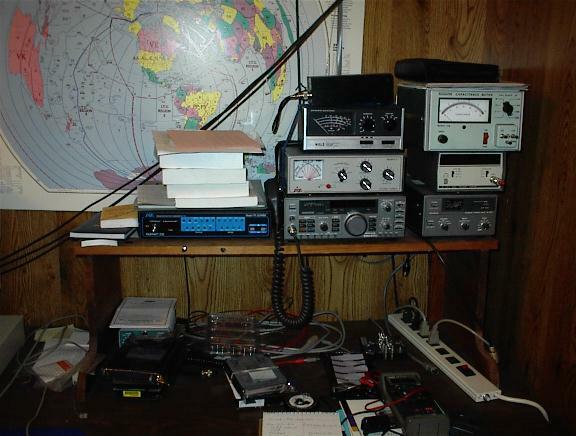 One the table is an ancient 386sx-16MHz which runs the ham radio bulletin board. (That is on the radio and not the phone line.) The back side of of Sue is seen sitting at a PII-400MHz machine. 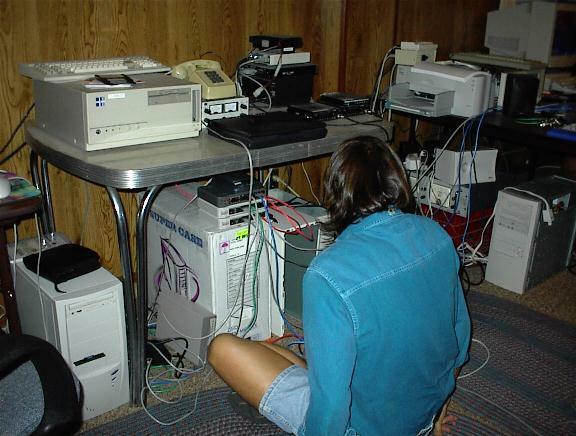 To the right of her stacked on the table are the two P-133MHz machines used to route and web serve. 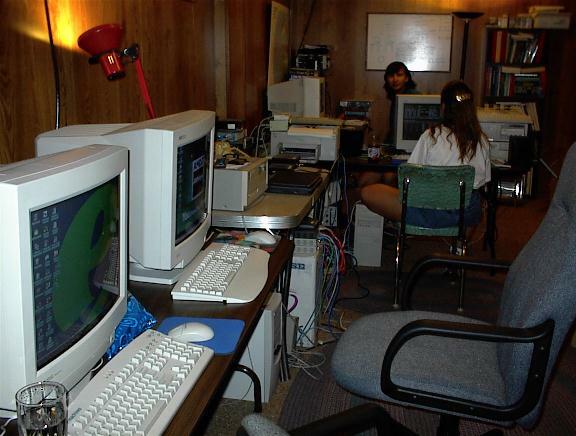 I am in the background sitting in front of the HP 712 Gecko. 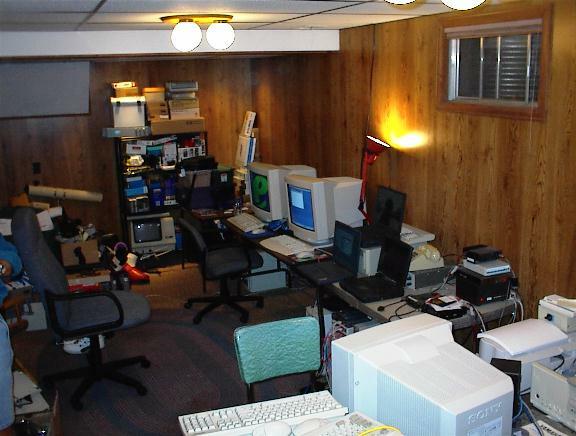 Just to my left is an old 486dx-33MHz machine which has been running Linux since 1993 or so. It is still my workhorse machine running my domain name, spooling news, handling mail, serving DNS and serving as a gateway to the phone line. Here is another view of the network. On the table next to the 386 are the radios for the radio bulletin board. one power supply is visible. The other is the dark brown splotch in the far back. Two Alinco 2m radios lie flat on the table. There is a Kantronics KPC-3 and a KPC-4 on the stack for amateur packet radio controllers. The network stack. I really need to get a few more ports. I am almost tapped out. 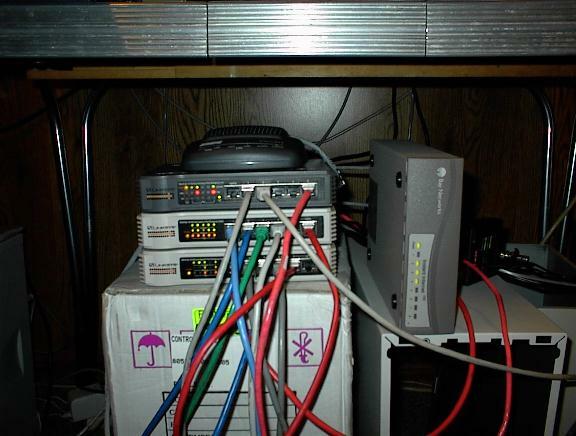 The two light tan boxes are Linksys 100BaseTX switches. The dark grey one is a Linksys 100BaseTX hub. On top which is hard to see is a Cisco 675 DSL modem. Shouldn't every home have 100BaseTX routed throughout? Being that just barely visible is a 10baseT to coax ethernet transceiver for the old 486. You can tell that I like having different colors to help keep the wiring straight. And no tour of my basement would be complete without at stop at the radio station. Don't mind the piles of junk on the table. I operate amateur radio station KF0UW from this location when not operating mobile. On the left is an AEA PK-232, at one time all mode, digital HF decoder for RTTY et al. In the middle is a Kenwood KN-140S with an antenna transmatch tuner above it. An SWR meter and dummy load. On the right is an automatic transmatch. On top of that is a frequency counter and a capacitance meter.